In light of Labour’s very strong performance in the capital in the local elections, I think there’s a good chance the party will perform better in London in the 2015 general election than nationwide opinion poll trends have been suggesting. We could see much higher swings, meaning far more seats change hands and a greater turnover of MPs. But a second factor – the Lib Dem collapse – could end up benefiting both Labour and the Conservatives. 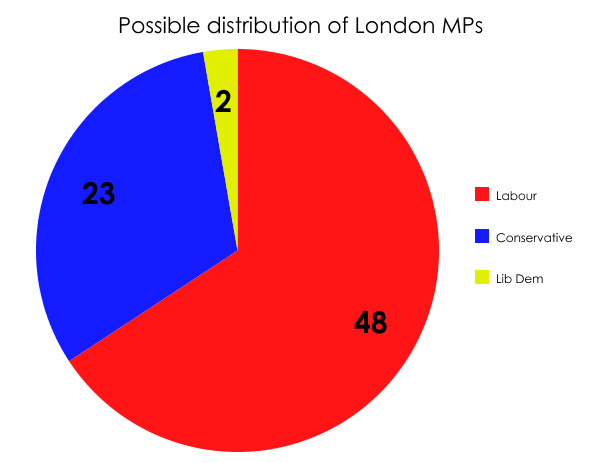 London might well be one of the few areas of the UK where the Tories notch up a number of gains at the general election, helping to offset those constituencies it’ll lose in the capital to Labour. I’m going to suggest that as many as 13 constituencies could change political colour. 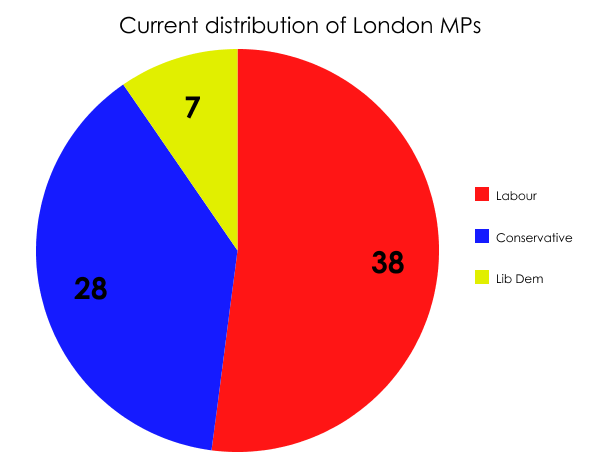 That would mean a turnover of more than one sixth of London’s MPs. Yes, that’s a gain for Labour of 10 seats. And not a net gain either. They will hold all of their current 38 seats, and could add up to another 10 more. That’s eight from the Tories and two from the Lib Dems. I mentioned the other day that I thought Paul Burstow had a decent chance of holding on in Sutton and Cheam, but were the swing against the Lib Dems to be an extreme one, even he may go down. Such an outcome would reduce the Lib Dems in London to just two MPs: Vince Cable and Simon Hughes. Energy secretary Ed Davey in Kingston and Surbiton is on the hit list because the Tories did so well in Kingston-upon-Thames in the local elections. The Tories would emerge from such a scenario with a net loss of five, though they’d actually lose eight of their sitting MPs. Mike Freer in Finchley and Golders Green is on the list thanks to the unexpectedly strong showing by Labour in the elections for Barnet council (of which Freer used to be leader). To repeat, I don’t think this kind of outcome would be reflected across the UK. I’m minded to say the nationwide swing to Labour will be much lower, especially in the rest of the south-east. But London has a long tradition of bucking the national trend, and looks set to do so again next year.